Bu araştırmanın amacı Pacini ve Epstein (1999) tarafından geliştirilen Mantıksal ve Deneyimsel Düşünme Ölçeğini (MDDÖ) genç yetişkinler üzerinden Türkçe’ye uyarlamaktır. Mantıksal ve Deneyimsel Düşünme Ölçeği’nin yapı geçerliği açımlayıcı ve doğrulayıcı faktör analizi yöntemleri ile güvenirliği ise Cronbach Alfa iç tutarlılık katsayısı kullanılarak belirlenmiştir. AFA sonucunda orijinal ölçekte olduğu gibi dört faktörlü bir yapı elde edilmiştir. Doğrulayıcı Faktör Analizi sonuçları model veri arasındaki uyumun iyiliğine işaret etmektedir. Ölçeğin açıkladığı toplam varyans %41.5tir. Sonuçlar uyarlanan ölçeğin geçerli ve güvenilir bir ölçek olduğuna ve ölçeğin yapısının uyarlanan grubun yaşına bağlı olarak farklılaştığına işaret etmektedir. The purpose of this study is to adapt the Rational Experiential Inventory which was developed by Pacini and Epstein (1999) on young adults. Exploratory and confirmatory factor analyses were conducted to determine the construct validity and the Cronbach Alpha correlation coefficient was used to examine the internal consistency of the scale. As a result of exploratory factor analysis, a-four factor structure-which is same as the original form- was determined. CFA indicated goodnes of fit between model and data. The total variance explained by the scale is 41.5%. Findings indicate that the re-adapted inventory is a valid and reliable inventory and its structure differentiate according to the age of the study group. Anderson J.C. , Gerbing, D.W. (1984) The effect of sampling error on convergence, improper solutions and goodness-of-fit indices for maximum likelihood confirmatory factor analy- sis. Psychometrika, 49, 155-173. Brown, T. A. (2006). Confirmatory factor analysis for applied research. (First Edition). 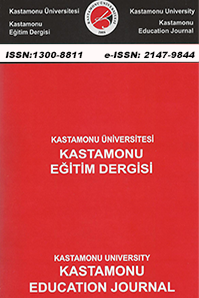 NY: Guilford Publications, Inc.
Büyüköztürk, Ş., Akgün, Ö. E., Özkahveci, Ö., Demirel, F. (2004). Güdülenme ve öğrenme statejileri ölçeğinin türkçe formunun geçerlik ve güvenirlik çalışması. Kuram ve Uygula- mada Eğitim Bilimleri, 4 (2), 210-239. Child, D. (2006). The essentials of factor analysis. (3rd Edition). New York: Continuum. Çokluk, Ö., Şekercioğlu, G., Büyüköztürk, Ş. (2010).Çok değişkenli istatistik SPSS ve LISREL uygulamaları (Birinci baskı). Ankara: Pegem Akademi Yayınları. Denes-Raj V., Epsteın S. (1994). Conflict between ıntuitive and rational processing: When pe- ople behave against their better judgment. Journal of Personality and Social Psychology, 66 (5), 819-829. Epstein, S. (1994). Integration of the cognitive and the psychodynamic unconcious. American Psychologist, 49(8), 709-724. Epstein, S. (1998). Cognitive-experientaial self theory: A dual process personality theory with ımplications for diagnosis and psychotherapy. In R. F. Bornstein and J.M.Masling (Eds. ), emprical research on the pschoanalytic unconcious (Vol 7, p. 99-140). Washington D.C: American Psychological Association. Epstein, S. (2006). Conscious and unconcious self-esteem from the perspective of cognitive experiential self theory. In M.H. Kernis (Eds. ), Self-esteem Issues and Answers: A sour- cebook of current perspectives (p.69-76). NewYork: Psychology Pres. Epstein, S., Lipson, A., Holstein, C., Huh, E. (1992). Irrational reactions to negative outco- mes: evidence for two conceptual systems. Journal of Personality and Social Psychology, 62, 328-339. Epstein, S., Pacini, R., Denes-Raj, V., Heier, H. (1996). Individual differences in ıntuitive- experiential and analytical-rational thinking styles. Journal of Personality and Social Psychology, 71, 390-405. Evans, J. (2008). Dual processing accounts of reasoning, judgement and social cognition. Annual Review of Psychology, 59, 255-278. Feng, B., Lee, K.J. (2010). The influence of thinking styles on responses to supportive messa- ges. Communication Studies, 61(2), 224-238. Flectcher, J.M., Marks, A.D.G., Hine, D.W. (2011). Latent profile analysis of working me- mory capacity and thinking styles in adults and adolescents. Journal of Research in Per- sonality, 46, 40-48. Hair, J.F., Black, W. C., Babin, B. J., Anderson, R. E., Tatham, R. L. (2006). Multivariate data analysis. (6th Edition). New Jersey: Pearson Prentice Hall. Hu, L. and Bentler, P. M. (1999). Cutoff criteria for fit indexes in covariance structure analy- sis: Conventional criteria versus new alternatives. Structural Equation Modeling, 6, 1–55. Jöreskog, K.G., Sörbom, D. (1993). Lisrel 8 : Structural equation modeling with the simplis command language. Scientific Software International. Kirkpatrick, L. A., Epstein, S. (1992). Cognitive experiential self theory and subjective pro- bability: Further evidence for two conceptual systems. Journal of Personality and Social Psychology, 63 (4), 534-544. Klaczynski, P. A., Cottrell, J.M. (2004). A dual process approach to cognitive development: The case of children’s understanding of sunk cost decisions. Thinking&Reasoning, 10(2), 147-174. Kokis, J. V., Macpherson, R., Toplak, M. E., West, R. F., Stanovich, K. E. (2002). Heuristic and analytic processing: age trends and associations with cognitive ability and cognitive styles. Journal of Experimental Child Psychology, 83, 26-52. Marks, A.D.G., Hine, D. W., Blore, R. L., Phillips, W. J. (2008). Assesing individual diffe- rences in adolescents’ preference for rational and experiential cognition. Personality and Individual Differences, 44, 42-52. Norris, P. ve Epstein, S. (2012). An experiential thinking style: its facets and relaions with objective and subjective criterion measures. Journal of Personality79(5), 1043-1079. Özyeşil, Z., Arslan, C., Kesici, Ş. Ve Deniz, M.E. (2011). Bilinçli farkındalık ölçeğini Türkçe’ye uyarlama çalışması. Eğitim ve Bilim 36 (160) . 224-235. Pacini, R., Epstein, S. (1999). The relation of rational and experiential information processing styles to personality, basic beliefs, and the ratio-bias phenomenon. Journal of Personality and Social Psychology, 76, 972-987. Pacini, R., Muir, F., Eptein, S. (1998). Depressive realism from the perspective of cognitive- experiential self theory. Journal of Personality and Social Psychology, 74, 1056-1068. Peterson, E. R., Deary, I. J. (2006). Examining wholistic-analytic style using preferences in early information processing. Personality and Individual Differences, 41, 3-14. Schutte, N.S., Thorsteinsson, E.B., Hine, D.W., Foster, R., Cauchi, A., Binns, C. (2010). Ex- periential and rational processing styles, emotional intelligence and wellbeing. Australian Journal of Psychology, 62(1), 14-19. Shiloh, S., Salton, E., Sharabi, D. (2002). Individual differences ın rational and intuitive thin- king styles as predictors of heuristic responses and framing effects. Personality and Indi- vidual Differences, 32, 415-429. Sladek, M.R., Bond, M.J., Phillips, P.A. (2010). Age and gender differences for rational and experiential thinking. Personality and Individual Differences, 49, 907-911. Stanovich, K. E., West, R. (1998). Individual differences ın rational thought. Journal of Expe- rimental Psychology, 127, (2),161-188. Sümer, N. (2000). Yapısal eşitlik modelleri: Temel kavramlar ve örnek uygulamalar. Türk Psikoloji Yazıları, 3 (6), 49-74. Şekercioğlu, G. Ve Güzeller, C.O. (2012). Ergenler için benlik algısı profilinin faktör yapısının yeniden değerlendirilmesi. Bilig, 60.215-236. Tabachnick, B. G., Fidell, L. (2007). Using multivariate statistics (5th Edition). Boston: Allyn&Bacon, Inc.
Teglasi, H., Eptein, S. (1998). Temperament and personality theory: the perspective of cogni- tive-experiential self theory. School Psychology Review, 27 (4), 534–548. Thompson, B. (2004). Exploratory and confirmatory factor analysis: Understanding concepts and applications. (First Edition). Washington: American Psychological Association. Türk, E. (2011). Ergenlerin düşünme biçemlerini yordayan faktörler: Anne baba, üstbiliş ve epistemolojik inançlar. (Yayımlanmamış doktora tezi) Ankara Üni- versitesi, Ankara. ISNAD TÜRK, Eylem Gökçe , GÜLLEROĞLU, Deniz . "MANTIKSAL DENEYİMSEL DÜŞÜNME ÖLÇEĞİNİN TÜRKÇE FORMUNUN GEÇERLİK VE GÜVENİRLİK ÇALIŞMASI". Kastamonu Eğitim Dergisi 22 / 2 (July 2016): 555-571.